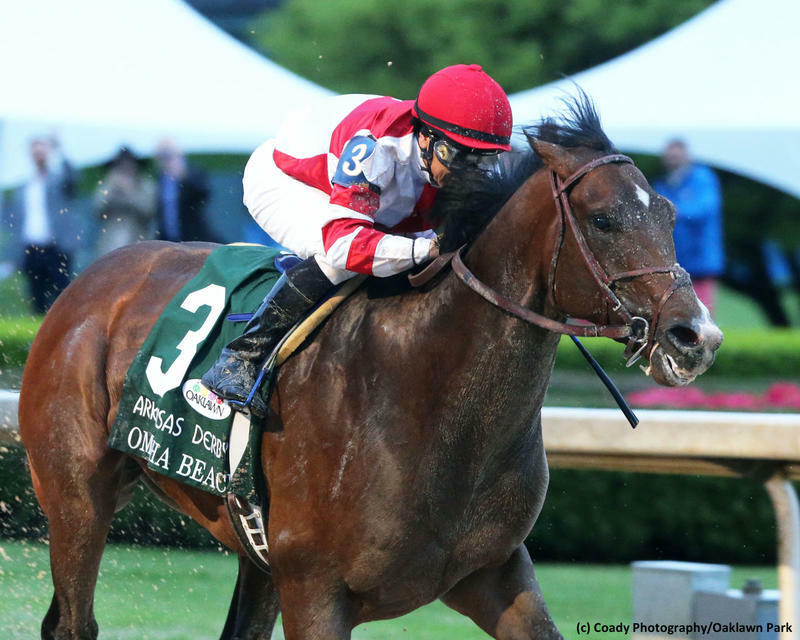 Fox Hill Farms’ Omaha Beach entered Saturday’s $1 million Arkansas Derby (G1) at a sloppy Oaklawn Park needing to secure a beachhead in the Kentucky Derby (G1), and hit the target under masterful steering by Hall of Famer Mike Smith. The slight 8-5 favorite repelled 9-5 second choice Improbable to earn 100 points in the final scoring race, bringing his Hall of Fame trainer Richard Mandella closer to a first Derby trophy. Omaha Beach was staving off a Bob Baffert beast for the second straight time at Oaklawn Park. Last out, it was hitherto unbeaten champion Game Winner who couldn’t quite get past him in the second division of the Rebel (G2). Omaha Beach garnered 37.5 points there, thanks to the splitting of the race, and that put him right on the bubble going into the final round of points races. Improbable was in an even more perilous situation with 25 points, after being upset in the first Rebel division by Long Range Toddy. Adding blinkers for the rematch in the Arkansas Derby, the Baffert trainee acted up in the gate, had to be backed out, and reloaded. Although he broke well on the rail, he raced farther back than might have been expected in the opening quarter-mile, and may not have been totally in love with the slop. Meanwhile, Omaha Beach, whose slop proficiency had been established in his Santa Anita maiden romp, was going through an impressive set of gears to improve his position early. Initially on the inside, Smith expertly maneuvered him outside into the clear and sent him after longshot leader One Flew South. Omaha Beach expended energy to take command on the backstretch, but still had abundant strategic reserve when Improbable loomed to challenge turning for home. The battle was on between the two top Kentucky Derby contenders in the race, with the rest of the field out of view, and Omaha Beach never looked like being overrun. Withstanding the siege of Improbable, he counterattacked by finding more in deep stretch and held sway by a length. The cleverly named son of War Front splashed 1 1/8 miles in 1:49.91 and upped his points total to 137.5, second overall on the leaderboard to Tacitus (150). Smith credited Omaha Beach and his trainer. Improbable garnered 40 points as the runner-up, boosting his total to 65 and accordingly guaranteeing himself a Derby berth as well. Watch to see if Baffert decides to keep the blinkers on, or take them off. Country House made a sustained move for a clutch third, good for 20 points that also elevate him into the Derby with 50 all told. Laughing Fox’s fourth netted him 10 points, his one and only showing on the points list. Next came Galilean; Long Range Toddy, who earned nothing here but still has enough (53.5 points) to make the Derby field; Jersey Agenda; Tikhvin Flew; Gray Attempt; Six Shooter; and One Flew South. Omaha Beach has improved since switching from turf to dirt. Now the winner of three straight, he sports an overall record of 7-3-3-1, and the $600,000 winner’s check made him a millionaire with earnings of $1,121,800. Bred by Charming Syndicate in Kentucky, Omaha Beach is a half-brother to champion Take Charge Brandi, the 2014 Breeders’ Cup Juvenile Fillies (G1) winner, and a full brother to Irish Group 1-placed Courage Under Fire. They’re out of the Seeking the Gold mare Charming, herself a half to champion Will Take Charge and Grade 1 scorer Take Charge Indy. Charming is a daughter of multiple Grade 1 queen, $2.4 million-earner, and Broodmare of the Year Take Charge Lady. Fox Hill’s Rick Porter has had a couple of World War II-inspired horses run well in defeat in the Derby, with Battle of Midway third in 2017 and Normandy Invasion making a big move before ending up fourth in 2013. Omaha Beach, picking up the Normandy theme, may surpass them both. By beating both Game Winner and Improbable, he’s stated his case to be the possible Derby favorite. Omaha Beach’s potential favoritism hinges upon whether Smith opts to stick with him in Derby 145 – he also just rode Baffert’s Roadster to a Santa Anita Derby (G1) victory over Game Winner.